Petrude Olds, Seattle Opera’s Properties Manager (or self-described “Prop Guy”) has worked for the company for 27 years. You may have seen him during a dress rehearsal—he traditionally comes out and takes a final bow with the performers—but otherwise he’s content to stay behind the scenes, using his broad range of technical and Boy Scout skills to create the props the performers use onstage. 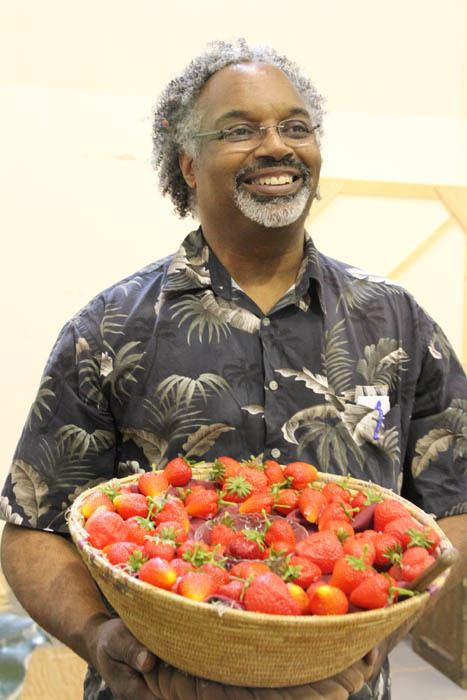 (Left, Pete with a prop used by Porgy and Bess's Strawberry Woman; Alan Alabastro, photo.) Recently, Pete was recognized for his dedicated volunteer service to the United Methodists Northwest Conference. Seattle Opera's Jessica Murphy caught up with him the other day and asked him about his work, his secret tricks-of-the-trade, and his favorite opera. 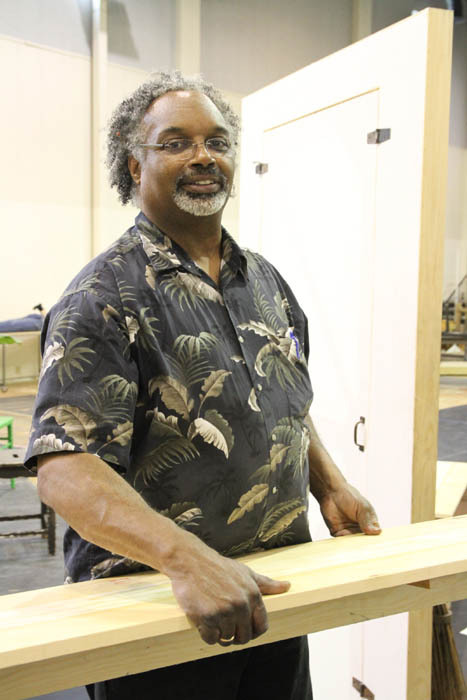 What kind of props are you working on now for Porgy and Bess? For Porgy one new thing that we are just right now getting to is a 10-foot banner for what a revival service that happens in the show. We started with a large piece of muslin that will be held between two 10 foot poles. We’ve also made some new benches. The show has lots of stools and chairs from that period, the 1930s, and since it’s in a poor neighborhood, nothing is in good repair. So the bench has to be sturdy but look like it’s not sturdy. It looks old. Philip Lienau, associate resident scenic designer with our Tech Department, designed the new benches. He’s designing and we’re building anything new in the show that did not come from Spain with the rest of the props. Just today we provided them a wheelbarrow. One issue: Porgy uses a crutch in this show, and our Porgy is quite tall. A standard wooden crutch was too short. So we found a long metal crutch, and by the time we’re done with it, you won’t know it’s a metal crutch. We also had to make watermelon slices. What will they be made out of? They were made out of Styrofoam, with a cheesecloth over them that is painted to look like watermelon. Yes. Before the directors get here, they’ve looked at the libretto and started figuring out how people are moving [on the stage]. Sometimes the libretto indicates what kind of props are in the show, and directors will usually add to the list. If we have a prop, we provide it; if not, we create it. My answer usually is “Yes...uh, do we have the money?” We can create just about anything. For the last show, The Magic Flute, we made the spears that the Three Ladies carried around that lit up. We had to create those from scratch, just from the director’s and designers’ idea. It was quite a challenge. We ended up starting with Star Wars light sabers, and cast new spear tips and powered up the whole thing so pushing a couple buttons made the lights come on. I heard that one of the props in Porgy is a breakable bottle. You want something that will break but not shatter? We have to live with what it does. In this case, we don’t want it to disintegrate totally, because the character has to use it as a weapon. Breakaway bottles tend to disintegrate when they break, [but then] the person doesn’t have anything to hold on to to use it as a weapon, so we’re working on that. But I don’t want to give away the secret. I’m sure you have a million secrets up your sleeve. But how does the bottle disintegrate? It’s not real glass. It’s usually resin. And the resin breaks up into dust and little pieces. If you were to step on them, they shatter into dust. So you have to buy eight of those, enough for each performance? However many we need. One for each rehearsal, and extras...sometimes they break just taking them out of the box. How do all of these things get communicated to you? The stage managers are at every rehearsal and take notes from the directors and singers. They give me notes about what changes or what needs to show up in props. Have you worked a Porgy here before? Yes, this is my second Porgy. The previous one (1995) used a set that Seattle Opera built, although the show was rehearsed in Houston. In that one, there was a goat pulling a cart to move Porgy around. So was the goat considered a performer or a prop? Any animal onstage is the responsibility of the props department. So you handled the horse and donkey in Don Quichotte? Yes, Desperado and Millie. And I spent a lot of time cleaning up after that donkey. Onstage and offstage. I have a new appreciation for what it means to have a live animal in performance! How long have you be working for Seattle Opera? Twenty-seven years. I started April 1, 1984. 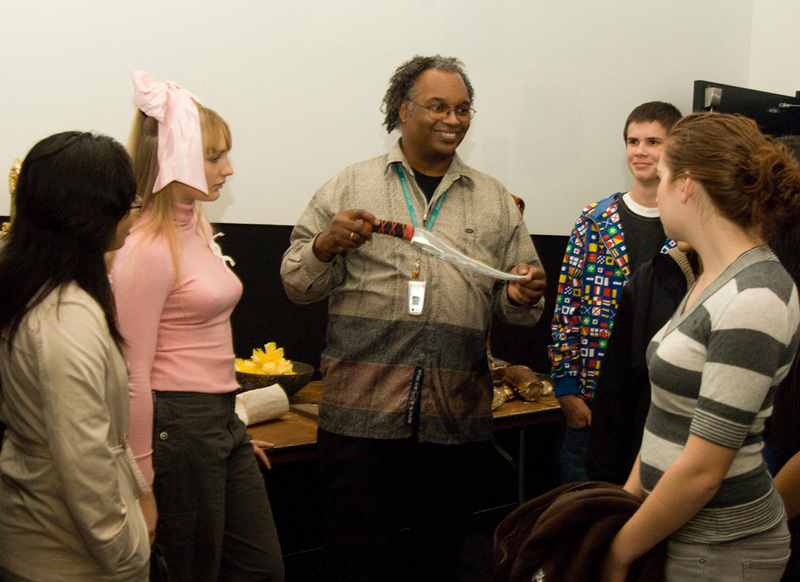 Have you always been interested in theater and the arts? No, I went to college because of music. 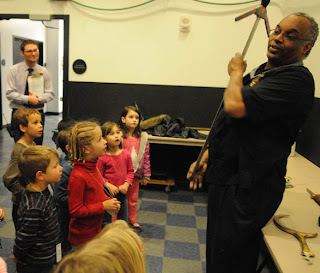 I played trombone, and a college said, “Come here and learn music.” But I got a job onstage, so I got exposure to lots of things. Oh, I hated to act. I was backstage. I was a tech guy all the time. Except when you bow at every Seattle Opera dress rehearsal. How did that start? What happened was, a stage manager was once looking for the conductor to come out and practice the bow. The leading lady usually comes out and gets the conductor to bring him onstage for his bow, but at this rehearsal the conductor wasn’t there. I was standing there, and the stage manager asked if I would you go out instead. “Sure.” So the soprano came over, and they put my hand in hers, and I went out and did the bow. They kept asking me to do that, and that was years ago. So you are really the conductor there. Do you have a favorite production? I have found a couple operas I really like after doing them more than once. My favorite opera now is Die Fledermaus. For some reason I have a history with it that is quite unusual. 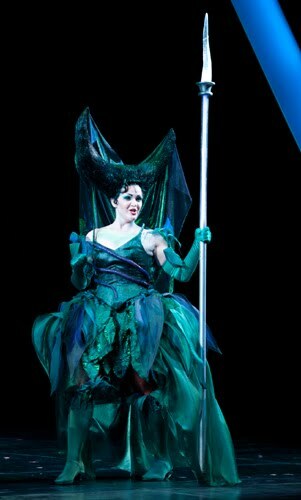 I grew up in the army, and while we were in Germany, my parents went to see Die Fledermaus. That night, I had a major part in a Boy Scouts banquet, and afterward I was waiting for my parents. They thought I was too busy, so they left me at this banquet and went to the opera without me, which would have been my first opera. 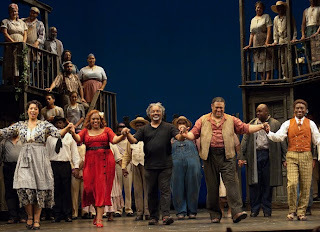 Then, when I finally got to do the opera at Seattle Opera years later, the music kind of got into me. I know that opera really well, I don’t know why. Maybe because it's a comedy, and I love to laugh. Tell us a little bit about the Bishop’s Award that you won this summer. I’m a United Methodist, and once a year the United Methodists in the Pacific Northwest meet--all of the churches in the Pacific Northwest, Alaska, some from Oregon and Idaho. There’s an average of 600 plus people that attend the conference. I was the representative from my church one year, and being a techie, sitting there watching things go wrong was bothering me, so I went and volunteered to help them, move a chair or whatever they needed. The next thing I know they’ve got me driving their truck, moving their equipment, helping get all the equipment to do the conference...and I’ve been doing that for about seven years, every year for a week. Every year the bishop who is in charge of the Pacific Northwest picks two people for an award for the service they provide to the annual conference. I was minding my own business this year when the person who works with me dragged me out and said, “There’s something wrong with this TV monitor.” I’m looking at it and thinking, “There’s nothing wrong with this TV monitor.” The bishop began reading about the person who was about to receive the next award, and I couldn’t hear him because I was too busy looking at the monitor, and then I hear him say that this person “takes a week off from Seattle Opera to come here and help us do this.” That’s when I knew I was in trouble. I got an award for providing services to them for the last seven years, and hopefully into the future. I love how you say that “Watching things go wrong was bothering you.” As a techie, do you find yourself getting roped into strange things outside of work? I had two kids going through elementary school, and I built haunted houses at school. I’ve been an auctioneer at school functions, I’ve been chaperone on many trips, and I‘ve helped with plays and musicals at schools. You don’t necessarily get roped into it, but how do you say no? And the equipment. And I think it’s really special to help the schools and help kids see that there’s more than being a basketball player or football player. There’s a whole area that some kids just miss. You do a great job in a great job!!! 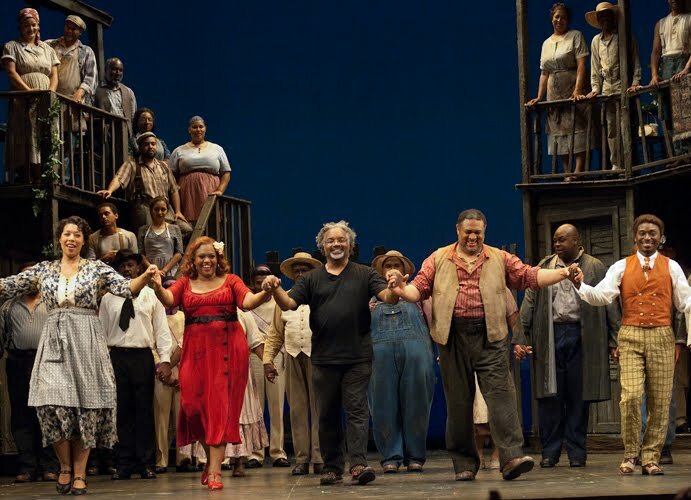 Toi, toi, toi to you and all others involved in "Porgy and Bess"!! !